Defence Minister Shri Manohar Parrikar today Commissions INS Kochi, the second ship of the indigenously designed and constructed Project 15A (Kolkata-class) guided missile Destroyers, Shri Parrikar gave two examples to illustrate his point- that of transporting drinking water to Maldives when the latter’s water treatment plant was damaged last year, and the rescue and evacuation of nationals of over 20 countries from war-torn Yemen by the Indian Navy, without any damage to our platforms and personnel. Shri Parrikar said while we have achieved significant indigenisation in ‘Float’ component of warships, we are lacking in the indigenization of the high-end Fight components. To that end, the Government is in the process of putting a policy in place to achieve high amount of self- reliance in the defence industry under the guidance of the Prime Minister Shri Narendra Modi. INS Kochi has been built by the Mazagon Dock Ltd., Mumbai. 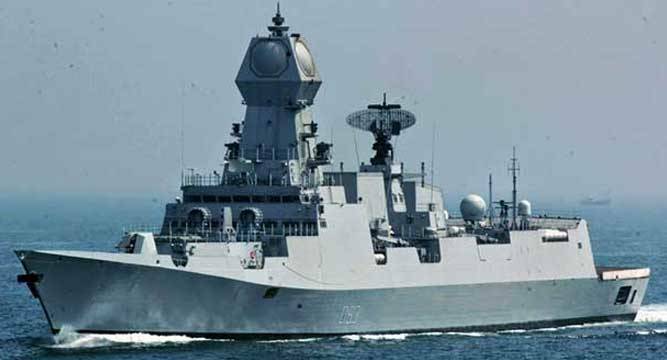 INS Kochi incorporates new design concepts for stealth and has many firsts to her credit, including a very large component of indigenous combat-suite. 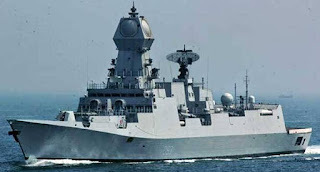 The ship is packed with the most sophisticated state-of-the-art weapons and sensors including the vertically launched Long Range Surface to Air Missiles (LRSAM) and MF-STAR multi-function active phased array radar, which is fitted only on the Kolkata class of ships. INS Kochi is equipped with the advanced supersonic and long range BrahMos Surface to Surface Missile – a joint Indo-Russian venture. The 76 mm Super Rapid Gun Mount (SRGM) and AK 630 CIWS, both manufactured indigenously, can take on air and surface targets. A state-of-the-art Combat Management System (CMS- 15A) has been integrated with the onboard weapons and sensors. The ship is equipped to operate two Seaking or Chetak Helicopters. The Ship can be truly classified as a 'Network of Networks' as it is equipped with sophisticated digital networks, such as Asynchronous Transfer Mode based Integrated Ship Data Network (AISDN), Combat Management System (CMS), Automatic Power Management System (APMS) and Auxiliary Control System (ACS). The unique feature of the ship is the high level of indigenisation achieved with most of the systems onboard sourced from within the country. Some of the other major indigenised systems onboard INS Kochi include the Electronic Warfare Suite, Foldable Hanger Doors, Helo Traversing System and Ship’s Stabilisers. INS Kochi derives her name from the vibrant port city of Kochi. This is a tribute to the city’s distinct maritime character and culture, and symbolises the special bond between the Indian Navy and the city of Kochi. The crew of the ship abides by the Sanskrit motto “Jahi Shatrun Mahabaho” which means “Oh mighty armed one… conquer the enemy”.